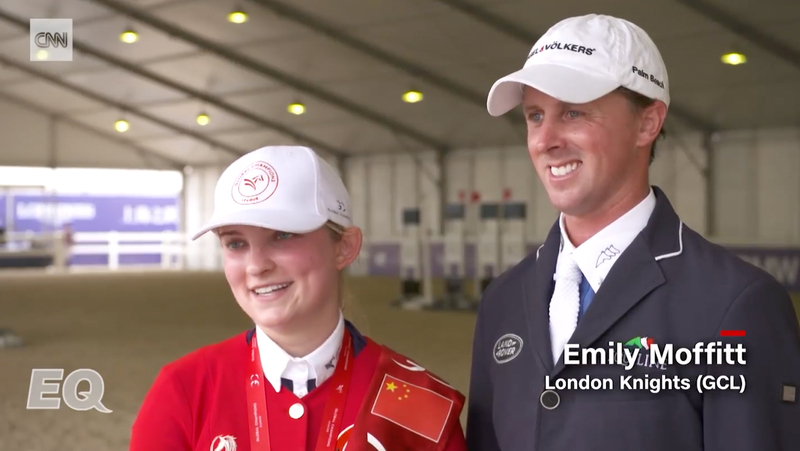 (CNN) - The third leg of the team competition was a nail-biter, with British riders Emily Moffitt and Ben Maher claiming the first win for London Knights by the tiniest of margins. The Knights, who had been in the lead after the first round earlier in the week, won the Global Champions League event by 27 hundredths of a second ahead of Simon Delestre and Jerome Guery of the Monaco Aces. Roger-Yves Bost and Dayro Arroyave of the Chantilly Pegasus finished in third place. "I'm feeling pretty awesome," Under-25 rider Moffit told the GCL website. "It's my first GCL this year and it's really exciting. I think it's even better as I'm [in a team] with my trainer, which brings extra excitement. The U25 riders are not expected to win, so this is really cool!" Belgian's Gregory Wathelet won his first Longines Global Champions Tour title in three years with a dominant performance in Shanghai. Starting in third place in a 12-horse jump-off, Wathelet knew he had to gamble if he wanted to have a shot at winning. "I knew I had to take all the risks and she jumped amazing," Wathelet said after clinching the jump-off on his 12-year-old grey Westphalian mare, Coree, with a clear round in 37.91 seconds. Britain's Ben Maher and Explosion W finished second in 38.55 seconds, followed by Germany's Daniel Beusser with Tobago Z in 39.11 seconds, in front of a fashionable sellout crowd at the China Art Palace. Check out the full story and video here!